In 2000, two St. Louis County brothers purchased some tow trucks from the Squires family. Starting in a small corner of Arnold, Squires concentrated on providing towing and roadside service for north Jefferson county and South county. In 2005 Squires expanded the original location to include auto repair and maintenance. 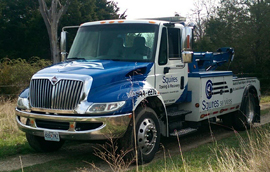 In 2011, Squires acquired the Southside Materials location in Affton Missouri and expanded the towing services into the St. Louis Metropolitan Area. In 2014, Squires has added a third location. The former Affton Auto Electric is now our newest full service auto care facility conveniently located on Gravois Road. Squires is the place for all of your Towing/Auto Care needs in Arnold and St. Louis. Our tow trucks operate 24 hours a day seven days a week. We at Squires understand how frustrating it can be when your car breaks down. Our goal is to provide you with the best auto care/ roadside assistance at a fair price. Our auto repair shop is open five days a week. Give us a call at one of our three locations and let us help you today! At Squires Services we take pride in the services we offer. We understand that it is inconvenient and upsetting to have your vehicle in need of a tow service or having locked your keys in your vehicle, and just as frustrating to find a towing company that you can trust. That’s why we have pushed the towing standards to a whole new level of quality. Our leadership insists on operating with the highest level of integrity and commitment to customer service. We strive to perform at levels that exceed your expectations!